Looking for Google Keep vs OneNote? In the tech world, many companies try to tackle down each other. The fight between two always leads to a comparison. This is a fight between Google Keep and OneNote. Both services are similar but have some unique features which make both different from each other. In current situations, one company is ruling PC world while other Android and internet world. How do Google Keep and OneNote stand against each other? Let’s find out in this ultimate Keep vs OneNote comparison. Google Keep is a web-based service which you can access on your browser. On the top, there is a space to start a new note. You can create notes, checklist, draw or add an image. Keep supports drawing, typing and pictures in one note, but it keeps everything in a sperate space. You can add an image to note and also type something below the image. An extension is also available for Chrome if you make notes very often. When you open a note, you find options including remind, add people, change note colour, add images, archive, delete, add a label, add a drawing, make a copy, checkboxes and copy the note to Google Docs. You can pin a note on top by clicking on the pin button. OneNote is a desktop app that comes with advanced features. It adapts the Office apps shape. The Home, Insert, Draw and View menus are on the top. It comes with a wide range to begin. The Home menu comes with tools including fonts, fonts size, colour, copy, paste and some more editing options. The Insert menu comes with options including tables, file, adding PDF, pictures, online videos, link, audios, meeting details and symbols. The Draw menu contains all your drawing needs including pens, erasers, shapes etc. The last one is the View menu which comes with window options, zoom levels, page colour options etc. OneNote desktop can store and show typed, drew, images, videos etc. in the same space. You can add these together as well. Both come with collaborating and printing options. One thing to consider is you will need an account to use their software. Score: Looking at the features I don’t know if we even need to speak the results out loud. In this Keep vs OneNote desktop comparison, we have the clear winner which is OneNote. Keep has an extension for Chrome, but that is not enough. Keep comes with necessary tools, while OneNote acquires tools from Word and other Office apps which makes it powerful and stronger. Keep uses simple interface. When you open the app, all the notes are there, while OneNote is different. OneNote shows your Notebooks when you open. You can create notebooks and then notes inside each notebook. Google Keep shows the type of note when we open the app. OneNote only shows a list of all the notes, and you can see what’s in it by tapping on the note. Winner: Create multiple notebooks, but we have a better interface in Keep. Score: Google Keep: 1, OneNote: 1. Both support typing, drawing, voice recording, shopping checklist, and images notes. OneNote has a feature of typing and drawing in the same space while Keep separates typed and drawn content. Google Keep doesn’t support anything like that but you can write stuff on the note, and the written material will be in a separate space and typed will in a separate. Winner: With OneNote’s drawing and typing feature and adding multiple notes, I’ll go with OneNote. Score: Google Keep: 1, OneNote: 2. Check out: Sygic vs Google Maps. Well, we have covered the top features now let’s look at what both apps can provide uniquely. OneNote comes with a badge so you can add a note anytime. OneNote: 4. Google Keep has an option to add multiple recipients to the notes who can collaborate. Google Keep: 2. OneNote has an option to disable syncing while Wi-Fi is not available. OneNote: 3. Want to set a reminder? Google Keep is there. Google Keep: 3. OneNote has a fantastic feature which only works on Samsung Galaxy Note phones. If you get the S Pen closer, it will automatically enable drawing mode. OneNote: 5. Both apps simultaneously sync the notes to the cloud so you can access them on any device. Tie. You can add links to the text in OneNote. OneNote: 6. You can add labels to your notes in Google Keep. Google Keep: 4. 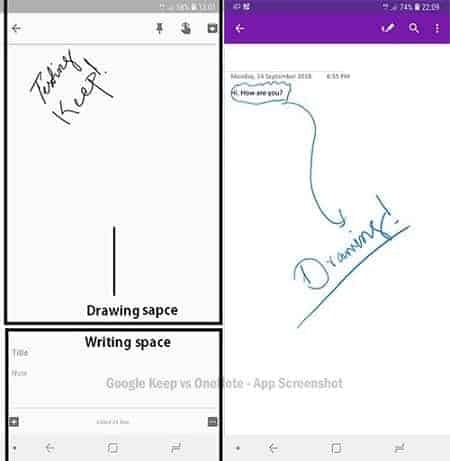 The desktop battle went to OneNote, and in the Android battle, the results are Google Keep: 4 and OneNote: 6. Google Keep is good for collaborating and it comes with basic tools which might or might not be enough. For now, you might have to try OneNote if you have never tried it before. Anyway, thanks for checking out Google Keep vs OneNote. What do you think of both? Which one do you use? Please comment on your thoughts so we can discuss more. Important information: Google Keep logo created by Stratos Stratos under Creative Commons and Attribution-ShareAlike 4.0 International (CC BY-SA 4.0). Read more at Use of Microsoft Copyrighted Content and Logo and Trademark Permissions on Google.